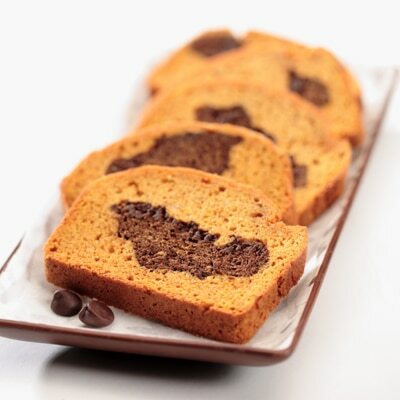 Featuring a pumpkin-chocolate center, this moist and flavorful quick bread is perfect for gift giving or an afternoon snack. The added pumpkin gives each slice a delicious dose of essential nutrients, including Vitamin A.
PREHEAT oven to 350° F. Coat two 8 x 5-inch loaf pans with nonstick cooking spray. MELT morsels in medium, microwave-safe bowl on HIGH (100%) power for 1 minute; STIR. Morsels may retain some of their original shape. If necessary, microwave at additional 10- to 15-second intervals, stirring just until morsels are melted. COMBINE flour, cinnamon, salt, baking soda and baking powder in large bowl; stir well. WHISK together sugar, pumpkin, oil and egg whites in large bowl. Gradually stir in flour mixture. Add 1 1/2 cups pumpkin mixture to melted chocolate; stir to combine. Spoon half of pumpkin mixture into bottom of each prepared pan. Spoon pumpkin-chocolate mixture between pans; top with remaining pumpkin mixture. Smooth down top. BAKE for 1 hour or until wooden pick inserted in bread comes out clean. Cool in pans on wire racks for 10 minutes; remove to wire racks to cool completely. Not a chocolate fan? Eliminate morsels from recipe and divide pumpkin batter evenly between pans and bake for 55 minutes.